The formal introduction of THE SERIOUS CITY, a new movement to consider why we do things, not just how, what, and where. 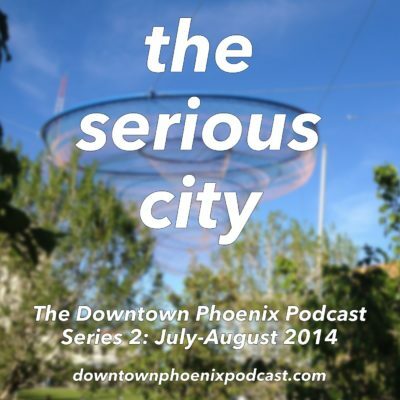 This week has been full of conversations, too: I had a phone chat with a friend who is spending some time away this brutal Phoenix summer in the Pacific Northwest and we discussed a lot of things, including the continued delays of the GRID Bicycle Share network’s launch. We discussed that some of the cities in the Pacific Northwest that have a strong bicycle culture and are known across the country and around the world for it (e.g., Portland, Ore.) do not have a bicycle share program but that has neither hindered nor hampered growth of bicycling there. We also wondered if Phoenix’s bicycle share system would be successful based on these criteria and what would happen during the summer, when outdoor activity should be curtailed. All of these conversations and events converged at a moment when I am asking of both myself and of our community: “What’s next?” My academic training is in urban studies and urban policy, after all, so I know my approach is different. I bring a different perspective to the table, something that I definitely understand. It’s frustrating to me when we consider some projects that have no academic basis for their success and, in my considered opinion, unfortunately won’t work. When we consider design above policy or economic activity, something I’ve strongly argued for in previous essays on this blog, that’s something that we should not be sustaining. Enter in THE SERIOUS CITY. I’ll be talking about it more in depth on Monday’s essay, as promised, but I’ll quickly explain it here. A Serious City is a city that asks “why” in its decision-making processes. It understands true urban context and understands that sometimes, the best approach isn’t the one that’s being done in every other city. That’s not to say that benchmarking and taking smart practices from other cities is verboten; instead, it takes those practices and evaluates them in a manner consistent with its urban environment. It also understands how to respond and react to criticism levied against it, differentiating factual observations from hyperbole and stretching of the truth. Whew. Next week’s essay — part II, if you will — will explain this in greater detail. Have a great weekend. Previous Previous post: Where’s the shade?